My 1998 Harley Fatboy for sale has 14 inch apes handlebars, a mustang motorcycle seat, a Kuryakin hypercharger, Vance and Hines exhaust. I've added Vance and Hines exhaust, 14 inch apes, a Mustang seat and a Kuryakin hypercharger. I'm located in Deer Park New York and my asking price is a very cheap $12,500. This barely used Harley Davidson has been ridden a total of only 10,500 miles and is all chrome with Sinister blue pearl paint. If you're interested in making an appointment to take a look or have some questions that you need answered you can reach me by e-mail using the comments form found directly below this classified. Strike Lightning Used Motorcycles for Sale would like to extend an invitation to anyone who is having problems fixing their 1998 Fatboy to leave their questions with a description the exact problem that you're having and your contact information in the space below and see if somebody who stops by may offer a solution for how to fix your motorcycle and the same goes if you would like voice your opinion by writing a review of Your Own 1998 Harley Davidson Fatboy. 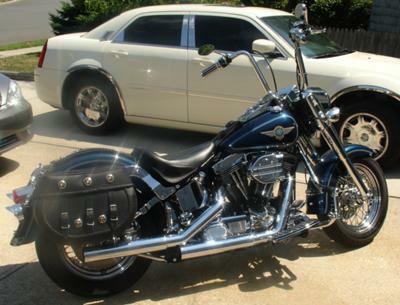 We encourage bikers to submit their opinions and reviews of the 1998 Harley Fatboy for sale, not to put anybody's motorcycle down but to help potential buyers make informed decisions and to benefit the biker community as a whole.